Using proven cooling technology and adding additional white space to the data center. The STULZ CyberHandler is a centralized air conditioning solution that is specially designed to free up space in the data center, allowing more room for IT equipment. Utilizing tried and tested precision technology from STULZ, the CyberHandler satisfies the exacting requirements for the air conditioning of data centers with a unit able to be mounted either on or next to the building. Indirect Evaporative Cooling Equipment (STULZ IeCE) embodies STULZ’ commitment to efficiency. STULZ IeCE is an indirect evaporative cooling solution, designed to remove heat by exploiting the evaporation of water. 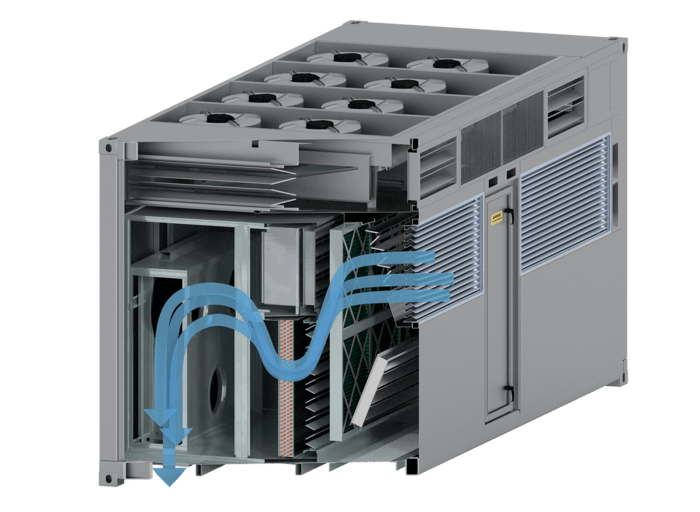 With an air-to-air heat exchanger STULZ IeCE is able to meet the needs of modern IT cooling without introducing the contaminants from outside air, all while achieving potential savings of up to 75% over traditional mechanical cooling methods. 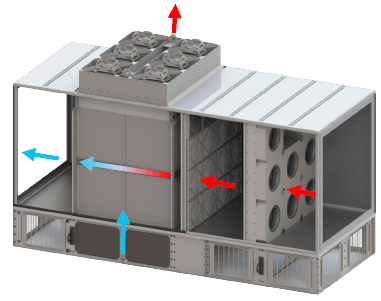 During the cold season, the scavenger air is capable of cooling the data center air without assistance from the evaporative system. Even when the ambient temperature is moderately warm to cold, scavenger air can be used exclusively to cool the data center air. Dry Mode can most likely be used every night, even in the middle of summer. During the warm season the evaporative system is utilized. Wet Mode applies when ambient temperature is hot, necessitating the use of evaporative cooling, but relatively dry so evaporative cooling can affectively drop the temperature appropriately. In extreme weather situations, the Direct Expansion (DX) or Chilled Water (CW) systems are used to supplement the cooling, as needed. DX/CW Assist Mode applies when ambient temperature and humidity are both high, reducing the effectiveness of evaporative cooling and necessitating the need for “trim” cooling from a DX or CW system. STULZ CyberPack provides a self-contained, DX air-cooled rooftop system, designed specifically for continuous operation in a mission critical environment. STULZ CyberCon provides superior value for precision temperature and humidity control in a performance optimized data center (POD). This air conditioning solution can be ready for quick deployment with minimal construction, installation and start-up time.